This attractive composition was painted by a well-known Palekh artist, Nikolaev Alexander. The subject of the composition is based on the popular Russian folk tale "Ivan Tsarevich and the Grey Wolf". The Fairy-tale tells about the adventures of the Prince Ivan Tsarevich and his companion the Grey Wolf, a magician. After the wolf ate Ivan's horse, they became partners in crime. The wolf felt sorry for Ivan, and he helped him in his quest to get Elena to be his bride. The Gray Wolf even helps Ivan when his brothers murder him and throw his remains in a bucket, out to sea. When the wolf gets the waters of life and death, Ivan is able to be alive again and go back to avenge his brothers. It is only then that Elena is able to marry the man she truly loves. Who knows if this would have happened if the Gray Wolf would not have been hungry the day Ivan's horse crossed its path. 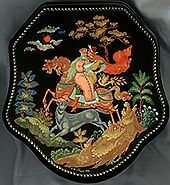 The scene depicted on the lid shows Ivan Tsarevich riding the Grey Wolf with Elena the Beautiful and holding the Fire Bird's cage in his hands. Gold and aluminum paints are used to paint the attractive patterns that frame the box's lid, and wrap around the bottom part of the box's body. The box is constructed out of paper-mache. Black lacquer covers the exterior and red lacquer covers the interior of the box. The box has a hinge above the composition and rests on a wavy platform. The work is signed with the artist's name and Palekh.